Heated arguments began before President Barack Obama even landed in China for the G20 summit on Saturday, and things just got worse when he did. Two Chinese officials nearly got into a fistfight with each other—yes, each other—and then others royally screwed up his usual exit from Air Force One. Under usual protocol, the president gets his or her own fancy staircase rolled up to the front of Air Force One in order to exit. 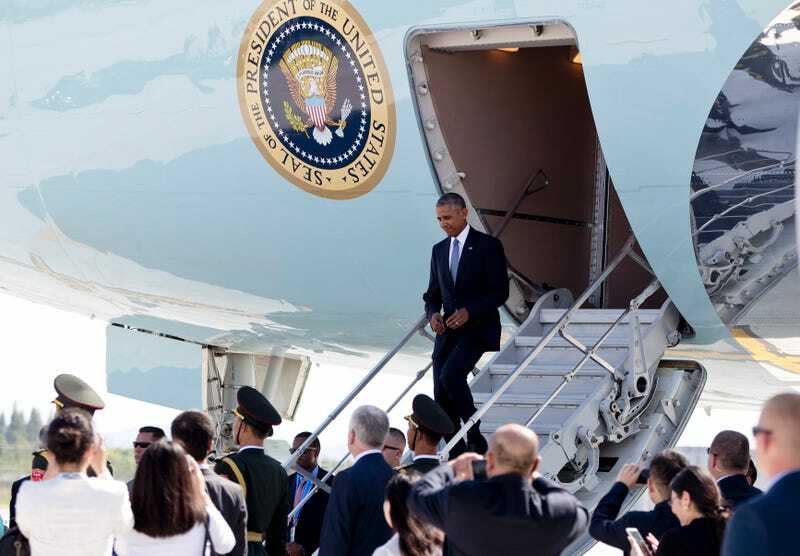 The Chinese wouldn’t have that on Obama’s trip to Hangzhou for the G20 summit—a meeting of world leaders on international financial stability—and there were no stairs waiting for him upon landing, according to the Washington Post. Exiting from the belly of Air Force One without your photographers in their normal places doesn’t sound the worst treatment in the world, especially when you’re used to flying economy. But there is some speculation that the move was a deliberate one by the Chinese, with the member of the welcoming delegation mentioned above quoted by the New York Times as yelling “This is our country!” in response to a White House official being less than thrilled with the situation. But the Americans weren’t the only ones who had to deal with angry officials in China—according to the Washington Post, Chinese officials were arguing with each other before Obama even arrived. In a debate about whether or not to let U.S. diplomats into a diplomatic compound before Obama’s meetings, the Washington Post reports that two Chinese officials reportedly almost had a fistfight. Shouldn’t they have figured this all out beforehand? The number of U.S. journalists allowed to cover Saturday’s events went from 12 to six, six to three, and then there was one. At the end of a long debate, a mere two journalists got to go along on a walk with the two presidents at the end of the day. Bill Bishop, a China expert whose Sinocism newsletter tracks the country’s political scene, agreed that Obama’s welcome looked suspiciously like a deliberate slight intended “to make the Americans look diminished and weak”. Some parts of China are flexing their muscles, but it sounds more like those parts are made up of Chinese officials preparing to fight each other rather than a country getting ready to show up another superpower. Either way, the New York Times quotes Obama as saying he “wouldn’t over-crank the significance” of it all.